By now you know that cooking is one of my very favorite hobbies. 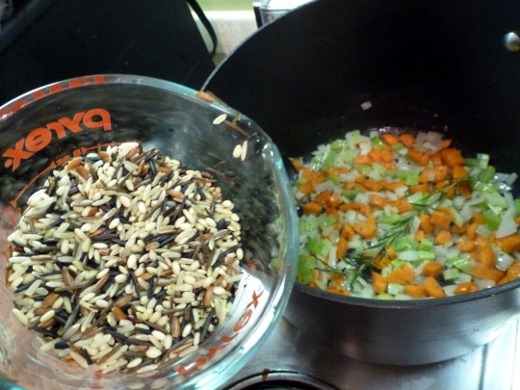 The prospect of trying a new recipe always excites me. Part of the fun is hunting for new ingredients to use in these new-to-me recipes. 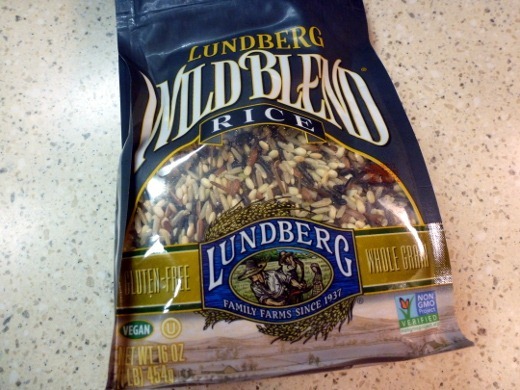 I first needed to find a wild and brown rice blend – which I did, quite easily at Meijer! 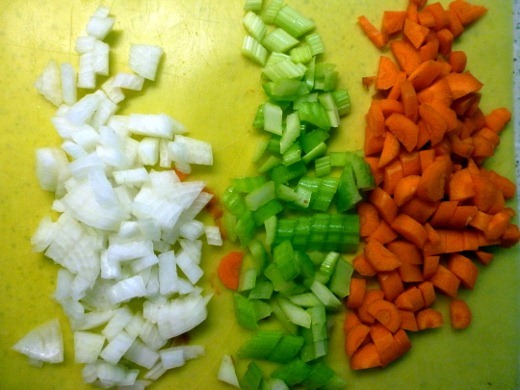 Next, I prepared my mirepoix – onions, celery, and carrots. The veggies were sautéed in butter with fresh herbs and garlic, until soft (and super fragrant!). Toast lightly, cooking for one minute, before adding reduced-sodium broth. Cover (don’t peek! 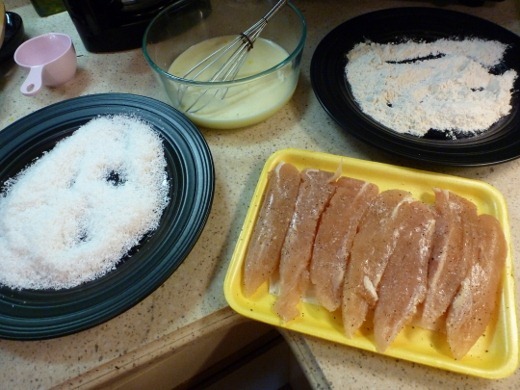 ), and cook for 45 minutes, then remove from heat, and let sit, covered for 10 more minutes. 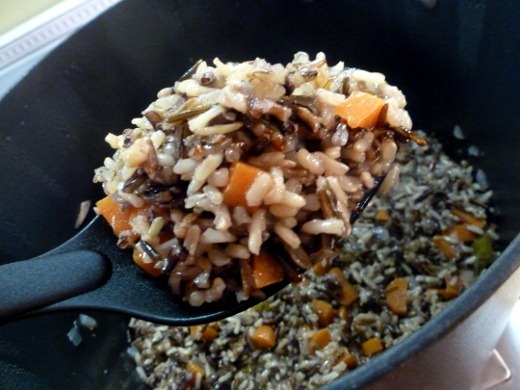 By now my mouth is salivating, I pop off the cover, and find this glistening pot of rice pilaf! Perfection! Fluff, season with salt and pepper, and nom it! Absolutely wonderful! Too often I reach for boxed rice blends with wacky ingredients, tons of sodium, and preservatives (but I can’t lie – I find Rice-a-Roni delicious and won’t act like I’m above buying it sometimes), but it was seriously awesome to make this homemade, nutritious, flavorful rice pilaf at home, free of wacky ingredients! 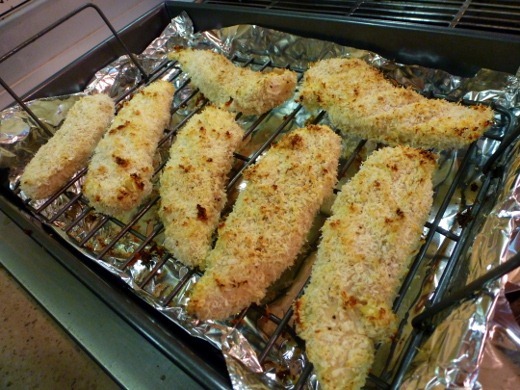 I absolutely love this recipe – so much bettah than da box! 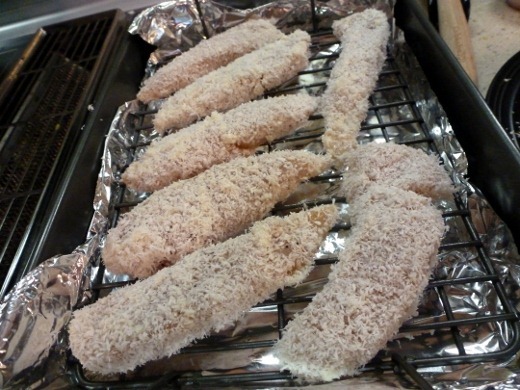 For the main course, Coconut Chicken Fingers from Cooking Light were on the menu! This is another new-to-me recipe. Rather than cook these in a skillet on the stove-top, I baked them for 30 minutes at 350 F degrees, because I prefer the texture of baked chicken over sautéed chicken, generally. With that said, these might be better cooked in a skillet because I bet the coconut might toast and brown better than it did in the oven. Finally, I turned the broiler on for the last few minutes of baking time to achieve a bit of color and toastiness. Regardless, these turned out quite nicely and were yummy. They did, perhaps, lack a depth of flavor. 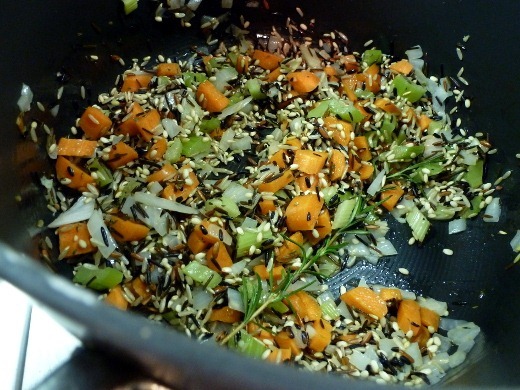 I would have liked more seasonings in this recipe – maybe a bit of curry powder? 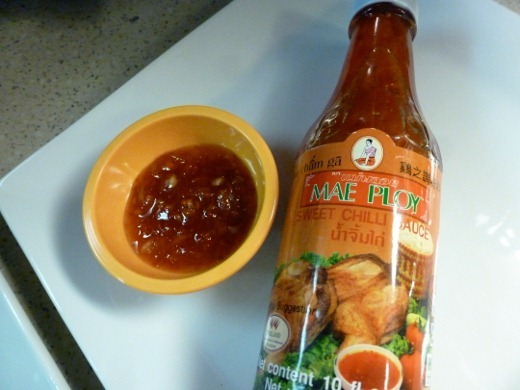 Essential – sweet chili sauce. 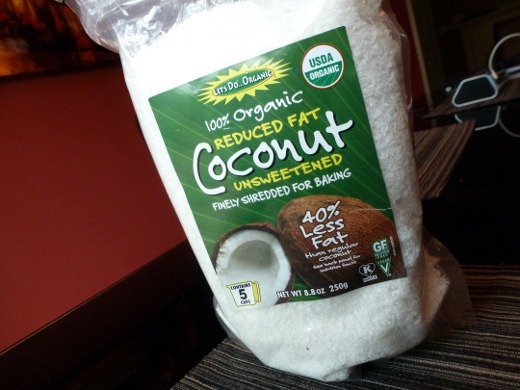 Another new-to-my-kitchen ingredient I picked up this weekend. This stuff is FANTASTIC, I tell you. Sweet, tangy, with occasional fiery specks of pepper flakes. Now that’s dinner! 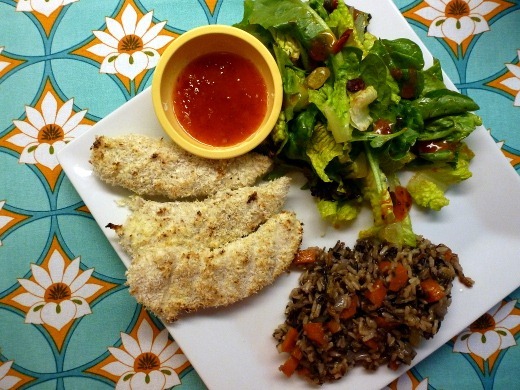 Coconut Chicken Tenders and Herbed Rice Pilaf! 1. In a saucepan over medium heat, melt the butter. 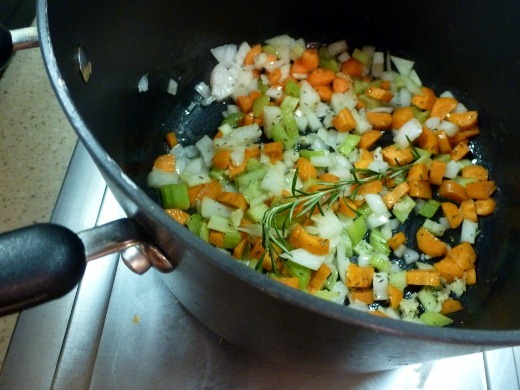 Add the celery, carrot, onion, thyme, and rosemary and sauté until the vegetables have softened, 3-5 minutes. 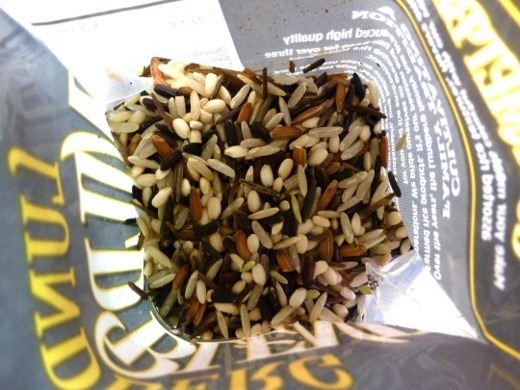 Add the rice and stir to combine. Cook for 1 minute to toast lightly. Pour in the broth and bring to a boil. 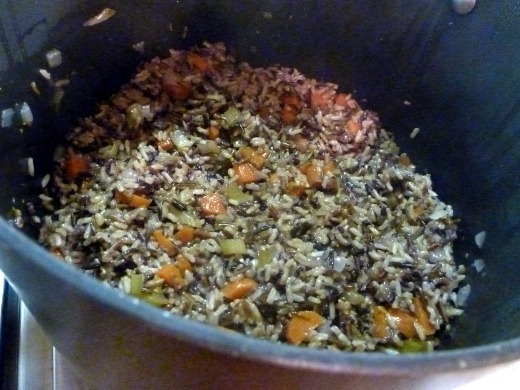 Stir, cover, reduce heat to low, and cook until the liquid is absorbed (40-45 minutes). 2. Remove from the heat and let stand, covered for 10 minutes. uncover and remove the herb springs, and fluff with a fork. Season with salt and pepper. Serve! Pingback: Dinner Meal Plan for June 2-8 | Meg.Goes.Nom.Nom.